Russian Prime Minister Dmitry Medvedev promised to cut the budget loose from its dependence on oil prices, seeing this as a vital step in guaranteeing the country’s economic security. The financial crisis has demonstrated that none of the world’s major economies can be considered immune from global problems. This was one of the issues covered in a speech given by Prime Minister Dmitry Medvedev at the Sochi Investment Forum. The years 2008 and 2009 proved that globalization had reached a stage whereby isolated events – banks collapsing in the United States, for example – cannot fail to have an impact on the economies of almost every other country in the world. This, according to the Russian Prime Minister, is one of the main lessons to be learned from the crisis. “In this day and age we cannot afford to think that our neighbors’ problems will not affect us,” said Medvedev. The Sochi Investment Forum is now in its 11th year. Held on the shores of the Black Sea, this event was first organized to increase investment in Krasnodar Territory; but then neighboring regions – particularly republics in the North Caucasus – became actively involved. What started as a regional event gradually turned, first, into a national and, finally, an international forum. Nonetheless, the main idea of the forum has remained the same: this is first and foremost a medium for Russia's regions. 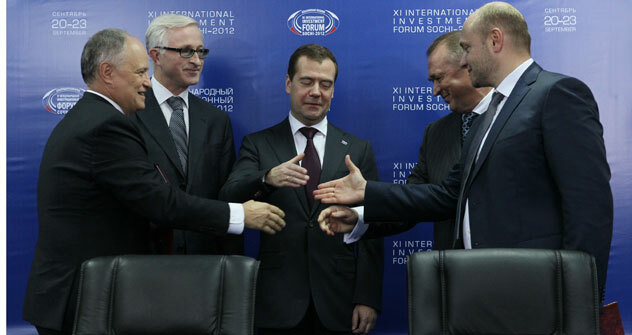 During September 20-23, 2012, more than 300 agreements were signed in Sochi, with a combined worth of almost 400 billion rubles ($12.8 billion). As well as Russian business leaders, the event was also attended by nearly 500 foreign participants representing 38 countries across the world. Today, Russia and the rest of the world are gearing up for the onset of the second wave of the global recession. Hardly anyone doubts the possibility of another crisis: for most, the question not if but when. In 2009, Russia’s darkest hour came with the slowdown of industrial output and the fall of global demand – both of which had an adverse effect on oil prices. In order to avoid a repeat of this experience, the Russian government is now taking concrete steps to free the budget from its dependence on “black gold.” As of 2013, for example, oil price forecasts will no longer be factored into the budget. “This was a tough decision to make, but we took it and are already working within the new framework,” said Medvedev, adding that all profits from high oil prices would go straight to the reserve fund. In 2012, oil and gas revenues made up just under half (47.3 percent) of the Russian budget. When drafting the budget under the old system, the treasury would look very closely at predictions of oil and gas prices for the year ahead. It is not difficult to estimate revenues from gas, since they depend on contracts rather than fluctuations in the stock market. However, predicting oil revenues always involves a certain amount of guesswork – it is virtually impossible to know how the oil share price will play out on the stock exchange. Consequently, by the old system, the draft budget would include several different models for oil prices over the year, and the treasury would have to draft several different spending plans based on these. In his speech at the forum in Sochi, Dmitry Medvedev made it clear that the government was dropping this practice, although he did not elaborate on how the budget would be calculated from now on. Even though this year's budget was drawn up under the old forecasting system, 2012 is still set to be a year of surplus, according to Ministry of Finance estimates. As planned in the draft budget for 2013, oil and gas will account for 44 percent of the treasury's revenue. This may be less than in 2012, but it is still nearly half the total budget. Economic rise: all talk, no action? Weaning the budget off its oil addiction will likely lead to cuts in government spending, suggests Daria Pichugina, an analyst from Investcafe. “In 2013, the Ministry of Finance expects to see a deficit of 0.8 percent of the GDP, and, in 2015, the budget should become totally deficit free. It has also been proposed that the government will cut spending by 3 percent; and this is being done primarily as a means to reduce the budget's dependency on oil and gas prices,” said Pichugina. Still, it is not entirely clear exactly how the government plans to reduce the budget's dependence on oil prices, especially given that income from the oil and gas sectors looks set to rise sharply over the next few years. The government recently decided to review export duties and extend the term of concessions on the mineral extraction tax, with the intention of applying them to new mining enterprises. Duties on mining projects in Eastern Siberia will be halved, while projects in Irkutsk Region, Krasnoyarsk Territory and Yakutia may be granted concessions on the mineral extraction tax until January 2017. The Arctic shelf will also enjoy these advantages up until 2019; in the Black Sea and the Sea of Okhotsk, these concessions will be available through 2020. The Ministry of Energy believes these measures will increase profit margins in the mining industry, bringing an additional $15 billion to the budget annually.